Cilantro is the perfect medicine in today’s heavy metal world. We are all exposed to varying levels of toxic metals, including aluminum, mercury, lead, and cadmium. Along with a pleasantly pungent flavor, this delicate herb binds toxic metals stored in our tissues so we can more easily excrete them. Low grade but chronic metal toxicity is more common than you think. Fatigue, feeling chilled, brain fog, digestive trouble as well as allergies and neurological symptoms, can be signs of chronic metal exposure, including aluminum or mercury. If you have mercury (silver) fillings, routinely eat fish (especially tuna) or breathe, you have mercury in your tissues. If you use typical deodorants or antiperspirants, drink much black tea, use aluminum cookware or store foods in foil, you are getting toxic aluminum. Vaccines may leave you with aluminum or mercury. I believe my early low thyroid diagnosis was in part due to mercury in my tissues. Chelating mercury with pesto and specific supplements helped me to heal my thyroid and come off medication. A regular dollop of cilantro pesto can be an effective, and tasty, part of a detox plan. It can also provide you with some added cancer-fighting folate, as well as detox minerals: potassium, and magnesium. 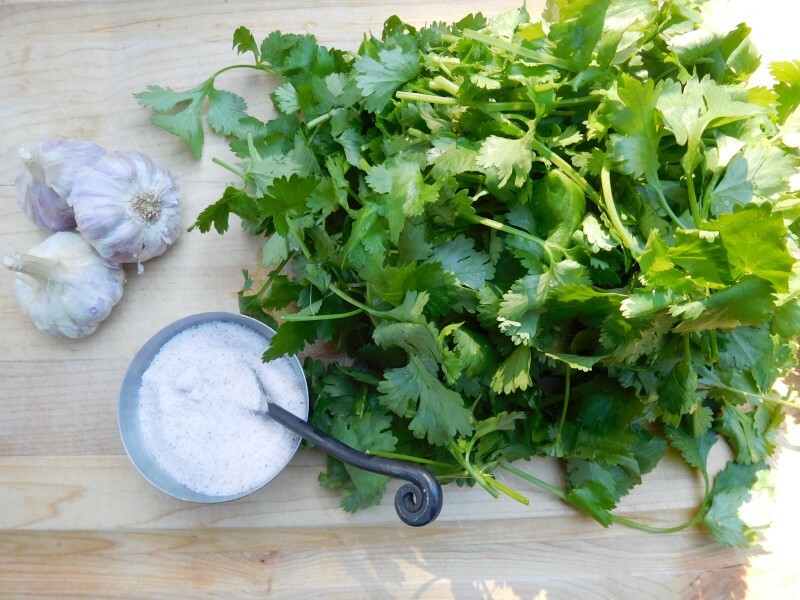 The pungent cooling flavor of cilantro blends well with spicy cuisine, including Asian, Caribbean, Latin and Indian dishes. Cilantro is one of those flavors people seem to either love or hate. Strangely, when made into a pesto with plenty of garlic and olive oil, many cilantro haters can’t tell that’s what they are eating and actually enjoy the fresh herby flavor. I first made cilantro pesto as a medicinal food, to help me chelate mercury. One evening however, some dinner guests discovered my green sauce and loved it. Now it is a regular on my appetizer table with gluten-free crackers and carrots. Make pesto. Here is my favorite pesto recipe. Drop peeled garlic cloves into food processor, and whiz until finely minced. Add nuts while blade is running and process until fine. Pack in leaves, sprinkle with sea salt, and drizzle with olive oil. Blend until smooth, adding more olive oil if necessary to give an almost smooth, but not runny, consistency. Add in cheese and pulse once more. Serve on roasted beet or potato slices, burger patties, roasted chicken, steak or baked salmon or use as a dip with raw carrots or crackers. I’m going to try the Cilantro Pesto recipe, we use cilantro a lot, Thanks!